What titles of honour did Oliver Cromwell create? Does anyone still use the hereditary titles he created? 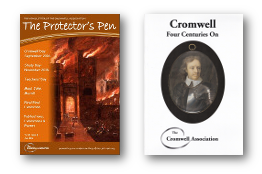 As Lord Protector, especially after his ‘reinvestiture’ under the revised written constitution of summer 1657, Cromwell held and exercised the power to bestow a range of titles of honour, some of them hereditary. At the Restoration of Charles II in spring 1660 all such titles lapsed as being without legal substance. However, through a mixture of generosity and expediency, Charles swiftly regranted many of these titles. 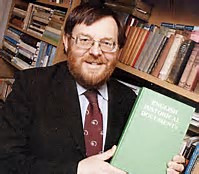 A handful of regranted Cromwellian titles are still in use today. Early in 1649, shortly after the execution of Charles I, the House of Lords was abolished – Cromwell did not play a significant role in this development and probably did not support this move – and it remained in abeyance until the Restoration, eleven years later. However, the long-established hereditary aristocracy was not abolished and existing hereditary titles were unaffected and continued not only to be used 1649-60 but also to be passed on from one generation to the next. During the 1650s, as before and since, upon the death of an existing earl, baron, viscount or whatever, the title passed to the deceased’s closest male heir. However, in the course of his Protectorate and exercising a right traditionally held by the head of state and specifically accorded the Lord Protector under the written constitutions, Cromwell made a number of new grants, bestowing titles of honour on a number of men who did not previously hold them. Cromwell bestowed over thirty knighthoods on politicians, administrators, financiers and other individuals he deemed worthy of the honour. Although they were all deemed invalid at the Restoration, many were regranted by Charles II in and after 1660. Knighthoods are non-hereditary honours, held by the recipient but lapsing at death, so all these titles have long since become extinct. In 1657-8 Cromwell summoned around sixty men, most of them senior army officers, politicians or administrators, to form a new ‘other’ or second House of Parliament, established under the revised written constitution of summer 1657 to provide a check or balance to the directly-elected House of Commons. A small number of these men already held existing hereditary titles of earlier royal creation, but most were commoners. Although this new second chamber, which survived until the collapse of the Protectorate in spring 1659, was often called the House of Lords and its members referred to, often sneeringly, as ‘Lord…’, the commoner members of this new House did not, in fact, receive titles of honour, hereditary or otherwise, nor did they retain any right to sit in the traditional House of Lords restored in 1660. Cromwell created one hereditary viscountcy, in July 1657 bestowing upon Charles Howard the title Baron Gilsland and Viscount Howard of Morpeth. The title lapsed at the Restoration, but in April 1661 Howard was created (or recreated) Baron Dacre of Gillesland, Viscount Howard of Morpeth and Earl of Carlisle. The current Earl of Carlisle and Viscount Howard of Morpeth is a direct descendant of this Cromwellian creation and Restoration recreation. Cromwell created one barony, in April 1658 bestowing upon Edmund Dunch the title Baron Burnell of East Wittenham. The title lapsed at the Restoration and was not subsequently regranted. Thereafter neither Edmund nor his son and grandson used or laid claim to the title. Any such possible claim lapsed completely and unquestionably with the failure of the male line in 1719. During 1657-8 Cromwell bestowed twelve baronetcies, a title of honour originally invented and granted during the reign of James I in the early seventeenth century. The baronetcy was (and is) an unusual title of honour, in that it is hereditary (with the holder being to be referred to as ‘Sir…’ and his wife as ‘Lady…’), thus passing from father to son or other direct male heir, but it has never brought with it membership of the House of Lords. All twelve Cromwellian creations lapsed at the Restoration, but around half of those baronetcies were swiftly regranted by Charles II. With the subsequent failure of the male lines, most have now become extinct, but at least two live on. Thomas Beaumont and Griffith Williams were created baronets by Protector Cromwell and had their titles regranted by Charles II in 1661; their descendants, bearing the surnames Beaumont and Williams-Bulkeley (the hyphenated ‘Bulkeley’ was added with royal approval in 1827), are currently 12th and 14th baronet respectively in a direct line of descent from those Cromwellian creations.